These luxury stand alone villas on the vineyard lake of Dromana are the quickest way to relax in privacy, with chilled Geppetto NV Brut Sparkling wine to make it picture-perfect. 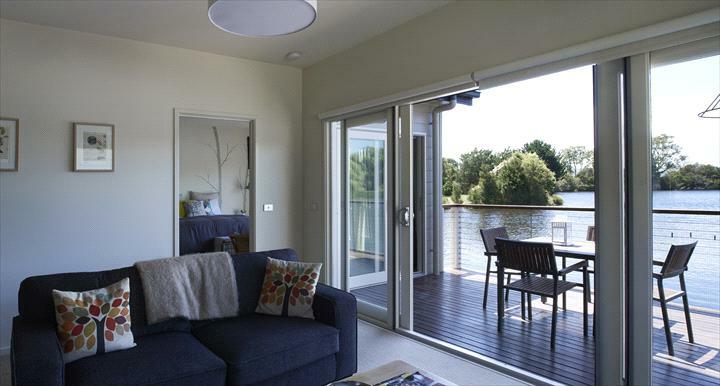 Lakeside Villas offer tranquil stand alone one bedroom villas within the Mornington Peninsula. Travel a short way to be immersed of spas, wineries and restaurants that the area is famous for. Have a glass of wine on your private deck or cook up a feast on the outdoor BBQ overlooking the picturesque vineyard lake. These self-contained villas has a great open-style kitchen, laundry and LCD televisions to makes it feel like (a better version of) home. From the Mornington Peninsula FWY take the Red Hill exit to Nepean Hwy. Continue along and turn left into While Hills Road and imediate left into Dunns Creek Road. Harrisons Road is the first street on the right hand side. Lakeside Villas At Crittenden Estate are approx 500 metres on the left hand side. - 10% of total tariff is non refundable once booking has been confirmed. - Cancelling within 30 days prior to arrival date 25% of total tariff will be retained. - Cancelling within 14 days of arrival date 50% of total tariff will be retained. - No shows or cancellations within 48 hours of arrival full amout is non-refundable. The 3 boutique villas are constructed entirely over the vineyard lake providing a sense of floating among the vines. Each secluded villa comprises a fully self-contained experience with a well equipped kitchen adjoining a dining area and expansive living room. The separate king size bedroom (king bed can be split into twin) has a large walk in robe, while other features include an authentic wood fire, deep spa bath and a BBQ on your private deck. RELAXATION- indulge yourself with a private in-room treatment or simply enjoy the peaceful ambience. Being a small family run business, we provide those smaller details to make your stay a memorable one. So next time you want to find your way to the produce, wine and rural experience that is the Mornington Peninsula, the Lakeside Villas is your ultimate escape. If booking direct through our webpage, a breakfast hamper is provided for your first morning and you will receive 2 wine tastings at the on-site Crittenden Wine Centre. A complimentary bottle of Crittenden Estate Geppetto NV Brut is provided for stays of 2 nights or more (if booking direct). Each unit sleeps up to 2 persons, however there is a pull out queen sofa bed in the living room which can sleep an additional 2 persons if required (additional cost is $100 for use of safabed). NB: 2 night minimum all weekends, although please call as we sometimes have one available (surcharge applies). Cot and highchair available at no extra charge (please advise if required). If you would like to book all 3 villas or 2 villas, please contact us. The restaurant is often booked out on weekends during the warmer months- we encourage guests to call in advance to make a reservation with the restaurant direct on (03) 5981 9555.